This silver coloured torch looks cool with the comfortable Aluminium alloy handle and features a super bright 1 Watt LED which at 38 Lumens is best in class for illumination. The torch has a 500mAh rechargeable battery backup inside but is solar powered so ideal for travelling, camping, driving and outdoor use. 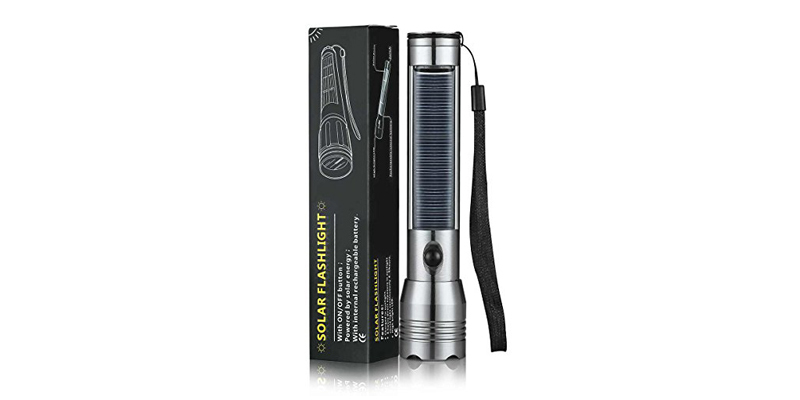 It’s a compact torch measuring just over 6 inches long and weighs in at less than half a pound, so will easily fit in a pocket or slip into a travel bag without taking up too much room. The ECEEN Solar Flash-light stores up solar energy and delivers bright white coloured light whenever you need it. Designed for outdoor use, the all-weather cast metal design is a simple and uncluttered design, with just a single on/off switch. The rechargeable battery can be charged using solar power during the day, or by AC charger at night. This is definitely a green gadget but it is useful too, providing a bright LED light which is effective up to a distance of 20 meters. The tiny solar panel can produce 80mah/2V and will easily charge the torch in around 8 hours if placed in an area with enough natural light. Charging using the included USB charge cable is faster at just under 4 hours – but pleae note that the torch must be fully charged before using, in addition the torch needs a regular charging even if you do not use it, it must be fully charged at least once every 3 months to preserve battery health. Also be careful about leaving the torch in extremely hot environment to charge, such as a car dashboard on a hot summers day, temperatures over 40 degrees can damage the device.